Don’t do it. It may seem like a smart idea to put an A/B switch in so that you can control what’s coming into your entertainment center. The problem is, it doesn’t work. I recently worked with a customer who wanted to use the wiring in his RV for satellite, cable TV and antenna use. He was only going to use one at a time, so he had the idea that he could use a switcher to control which source was in use, and then split the signal out to his TV and satellite receiver on the other end. Really, there isn’t an A/B switch that’s designed to work with satellite TV. They’re all designed for antenna or cable. It’s not that it’s impossible but there are a lot of technical challenges. A/B switches are not designed to pass voltage. In a satellite TV system whether it’s SWM or the older generation, there’s always voltage on the line. In fact there is more voltage on a “legacy” system than there is on a SWM system. In a SWM system only one cable between the receiver and SWM passes voltage. However, that voltage can be a lot higher. An A/B switch is theoretically going to switch between a voltage-carrying line and one that carries no voltage. This imbalance can create a spark when the switching takes place and that’s where electronics tend to stop working. You can’t really isolate out that voltage or your system isn’t going to work. Satellite TV signals either run from 950-2100MHz or in the case of SWM, from 1700-2200MHZ and also down around 2MHz and from 450 to 600 MHz. Of all those ranges, only the 450-600MHz signals will pass properly through an A/B switch. Every piece of equipment has specs, and I guarantee that no A/B switch is designed to pass anything as low as 2MHz or as high as 2100MHz. When a device isn’t work with a frequency range, you will generally experience a lot of loss. That means that you might not get good satellite reception even if you use the shortest, best quality cable. 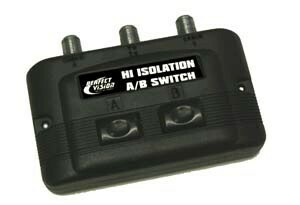 With an A/B switch even the short runs used in an RV might be too long. The final straw here is that the extra internal wiring and switch components of an A/B switch are going to create a problem. Any time you add complexity, you lose signal and add noise. You can amplify the signal again but once you introduce noise you never ever get rid of it. Noise is a problem that you’ll never solve, not really, and that’s why it’s important to avoid it if at all possible. Why would you even want an A/B switch anyway? This sort of request comes up because with DIRECTV’s SWM technology, it’s almost impossible to diplex an antenna signal in with a satellite signal. It used to be a fairly trivial matter but now it’s just not allowed, because the frequencies used in antenna TV interfere with the signal that allows you to share programming between receivers. So, folks, the only good solution here is to run more than one cable. I know that can mean a lot of time and money, but it’s really your only choice for reliable satellite TV reception.